I love canning jars! They are so handy for so many things! I wanted to share with you a few of my thrifty and nifty ways to put new lids on them to use for other purposes. These are all no cost or low cost which is even better! Did you know that those green lids from an empty jar of grated paremsan cheese fits perfectly on a canning jar? Perfect to make your own dressings or sauces. My hubby loves to use them when he opens a jar of my home canned salsa. 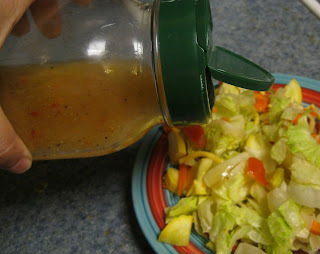 Makes pouring the salsa super easy! I use it to make my homemade garlic bread seasoning too! Here is another great way to reuse an empty container. 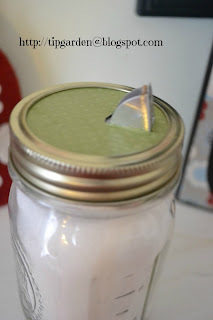 This pour spout cut from an empty salt container is perfect for keeping salt handy by the stove (but in a much cuter container than the cardboard one!) when cooking, or for other bulk seasonings . I took the extra step of covering my lid with scrapbooking paper, but it is not necessary. Cut out around your traced lines. Place new lid on jar and secure w/ a canning ring. A flower frog is a grid that helps you know where to put flowers to arrange them yourself. You just stick a stem in every square and helps you design your own flower arrangements. Here is a simple idea to make your own for your canning jars, instead of buying them. (Yes you can buy canning jar "frog" lids, if you didn't know). This photo is from Four Corners Design. Click on the link to go see how they did it!